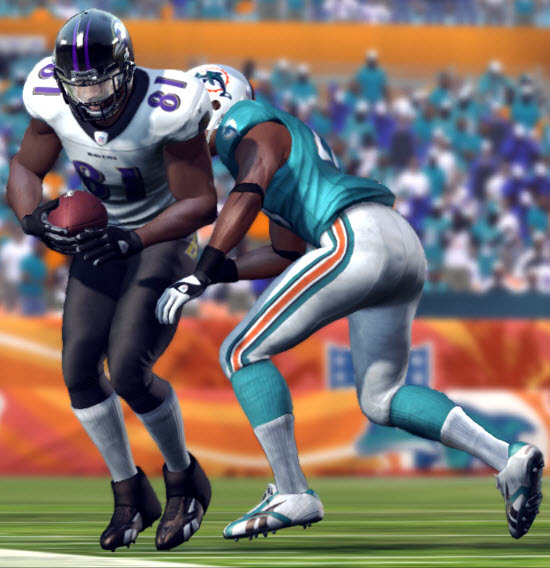 EA's new Locomotion system aims to enhance the realism of control physics in Madden NFL 11. In an April 7 announcement on the official EA Sports Madden NFL blog, Lead Gameplay Designer Ryan Burnsides has announced the implementation of a new and more sophisticated system of player movement physics in the Madden NFL series, called “Locomotion”, which will come into effect with the release of Madden NFL 11. The new Madden NFL Locomotion system includes a number of additions to the complexity of the physics of player motion which are intended to add significantly to the realism of many aspects of gameplay involving running. The enhancement of the effect momentum and acceleration, integrated into the running game are expected to be the most noticeable of differences. Also affected will be the quickness with which players of differing attributes of skill and athleticism will be able to change directions quickly and pull off more complicated running techniques such as jukes, strafing, and maintaining balance in the midst of sudden direction changes and impacts. Burnsides states in his blog that in Madden NFL 10, the integration of such complicated effects of physics which have ultimately become the goal of Locomotion was successful to a degree, but were “difficult to tune”, which—although the gameplay of Madden 10 managed to retain as solid and realistic a feel in the running game as any previous installment—was especially evident in some of the more awkward running visual animations. It is the hope that with the next installment in the Madden NFL series that not only will the animations and gameplay take on a more realistic look and feel, but that the successful implementation of the Locomotion system will coincide with an increased level of control responsiveness to allow the game to achieve the full benefit of its new enhancements for a product which EA and fans of the Madden NFL series hope will result in a product with a level of realism which has remained unseen thus far.